Hans Green imagines the internet going quiet. They forget about the crazy world for a few minutes. They ignore their Facebook notifications and live news feeds. They don’t even notice their coffee going cold. Could he write a blog post so good? But then again … when he was reading the new Jack Reacher thriller, he was gripped by the story. He forgot his exhaustion and read until 3am. Stories transform dull tips into sparkling information and sticky advice. They turn lackluster lessons into engaging adventures. Stories help you stand out from the drab blogging crowd. Your content becomes unique because nobody tells the same stories as you. Becoming a storyteller is not as difficult as it may seem. You don’t need to become the next Lee Child. You don’t need to write a 400-page bestseller full of twists and cliffhangers. 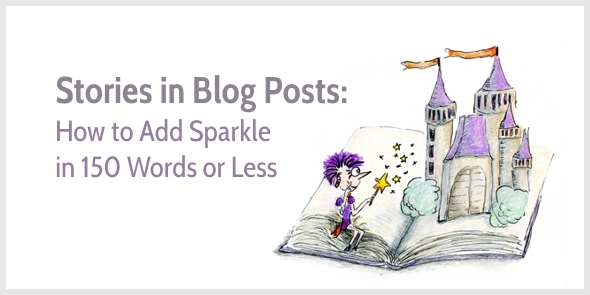 A simple story of 150 words is enough to delight your readers and turn lackluster writing into sparkling content. A good opening story entices blog visitors to read your blog post. On Jan. 2nd, Heather browses her draft articles. She doesn’t feel like writing a complete blog post. Not this week. Heather is surprised to find 31 drafts in her folder. Why did she never finish these posts? Surely, she thinks, one of them must be almost ready for publication? Red-cheeked, with hope in her heart, Heather opens her documents. One by one. She reads an opening here, and scans the subheads there. Do you recognize the feeling? Do you ever look at a first draft with despair? But an opening story can remain unfinished. You can simply sketch the problem. Because the remainder of your post shows readers how to solve it. The aim of a closing story is to take away an obstacle to implementing your tips. Personal stories are a great tool for bonding with your readers. You position yourself as a guide, and show them you understand their pain. You explain how you overcame this pain so your readers can, too. To write a powerful closing story, think about your readers’ objections to implementing your advice. Did you experience the same struggle? Can you explain how you overcame it? Sometimes your readers may not understand what their problem really is. They know something doesn’t work, but they don’t know exactly what’s wrong. The aim of an explanatory story is to show readers the problem and make it concrete. For instance, many websites are full of company information without explaining what’s in it for the customer. In the paragraph below, I explain this problem by telling the story of a visit to a bike store. And you really don’t know much about bikes. You have no idea what the guy is talking about. He makes you feel stupid. You feel like running home and giving up your plan about getting fit again. It happens all the time on websites. Stories don’t have to be real. This is a made-up story, but it’s still based on my personal experience of trying to figure out what bicycle I should buy. When you base your story around a personal experience, it’s easier to sketch a vivid scene with specific details. I thought storytelling was for the “real” writers. For the creative folks, who keep diaries, write travelogues and have the ambition to become the next Hemingway, Lee Child, or Isabelle Allende. I have no ambition to write fiction. I write blog posts, web copy and emails. But without realizing it, I started writing stories for my clients’ About pages, and I included mini-stories in my own blog posts. Storytelling is human. We all have stories to tell. And when you keep your stories short, they’re easy to write. 150 words is enough. So don’t feel shy. Try telling a story in your next blog post. There are no real writers. But you know that by now, I hope! She’s a wacko. Fire her. PS Love the first drawing. You know my passion for storytelling, and that I can get carried away… into a fairytale. You woke it up in me during the Blogging course last year. Thank you! To my great surprise, you also taught me to write a story for my About page. It has changed it dramatically, I just love the result! Not that I want to become another HC Andersen or J Rollings but I agree that stories are very helpful and entertaining. They show problems and possible solutions in a soft, unintrusive way. And they stick better, too! Thank you for the great reminder ? I love how you put that, Irina: “Stories show problems and possible solutions in a soft, unintrusive way” That’s so true! Thank you for adding that. And I’m so glad you connected with your inner storyteller 🙂 Keep those stories coming! I forgot to mention your new cartoon – that’s beautiful. ? Hmm. In looking at your 3 examples, I’m noticing that the opening & closing stories seem to be based more on either personal experience or tapping into the reader’s psyche. Either way, the effect is for the reader to feel that your understand their predicament. The explanatory story is more of a real life analogy. A parallel to the ‘real’ problem, in other words. Would you ever advocate using an analogy type story as an opening? Why, or why not? You enter a room full of serious grey suits politely sipping their wine, bragging about their corporate missions. Rather boringly. And there you are, in your purple shirt, feeling out of place. You grab a glass of beer, and tap a fork against the glass to attract attention. A business story doesn’t need bravery like that. But a good business story has the same impact: You attract attention. You stand out. You invigorate your audience, and pull them closer to you. They get inspired. I personally have a preference for a more empathetic opening, but the analogy works, too. Perhaps I should use it more often? I was thinking how stories captivate a reader. They are a great way to open a post. Why is it openings seem so difficult? You’ve captivated me with your fairytale castle. Love how you’ve drawn the book too. I can picture Henrietta turning the pages. Yeah, I know. I find openings tough, too. I always write them after I’ve written the main post, otherwise I’d never get a blog post written! And thank you for your compliment on my drawing. I enjoyed making it! I just made one up that I am using in an article. Pretty cool. Stories are an untapped resource for blog posts. Yep, I agree: an untapped resource. I once got a writing job by submitting an article that included a story. Boss said, “I love it; hire her!” Haha! When I related the story of the success of this ^^^ story, as a way of garnering fans, in a comment contest, I won $100. Okay! It’s true! Stories are so fun. People will stop to listen. And it’s that “stop” we want. Once they stop…we can get through. Love the Disneyland drawing. You make a cute Fairy Godmother! Heh heh. That’s a great example of the power of storytelling. Thank you for sharing, Katharine. Or perhaps, for some of us anyway, you are one? And, it just so happens, you told me once to try writing 200-word emails, like your mini course, and I just pulled what you suggested out to help remind to stay on track and do it. I actually think, it’s really good writing practice to limit the number of words we want to use. I learned a lot from writing my snackable course because I set myself that limit of 200 words. And with storytelling it’s great to be brief, too, because most of us (me, too!) have the tendency to include too many details which water our story down. Once again, good on you Henneke. Fantastic insights. Storytelling here I come. Your opening story about writing like Lee Child had me hooked. You never know. One day, maybe. I’ve come across more opening stories on the web, but I like the idea of weaving them in elsewhere. I wrote an imaginary story in my first ever blog post, but I tend to cringe when I read it back now. Perhaps it’s time to start being adventurous again? Yeah, why not? Perhaps you’re the new Lee Child, and I can say in the future: you know, David Hartshorne used to read my blog. 😉 What amazes me about Lee Child’s writing is how much detail there is about guns. What makes you cringe about the story you’ve written before? How would you rewrite it now? I would certainly give it another try – either by rewriting that story or starting afresh with a new one (which every option excites you most). Brings many memories to mind. I was a child when the only medium of media available for road trips was what could be dialed in with an AM radio knob. My grandparents would ask my cousin to sing us a song. They knew better than to request that of me, the tone-deaf one. When Cousin Dawn’s voice gave out, they’d turn to me. And my game was to weave them all in as characters on an adventurous quest that obliquely reflected real-life problems. Maybe that’s why I’m so passionate about copywriting in a content marketing context. It resonates with what I’ve been asked to do my whole life. But even as it is something I’m both comfortable and familiar with, I truly appreciate the specific and personal feedback from Henneke in the courses. Yep, I’ve reserved my spot in the Business Blogging course. I hope to see you in the forums. PS. Henrietta makes a marvelous fairy godmother. It sounds like you had a lot of storytelling practice in your life! Thank you for joining the Business Blogging course, Lori. We’re going to have fun! Thank you, Daniel. I appreciate your compliment. I realized a while ago that I shy away from writing my blog posts as you mentioned in some of your other blog posts. I usually find myself procrastinating. But recently I started writing short stories (which I will not put on my website) and they really help me improve my writing a little bit but more importantly I realized I enjoyed writing more. That’s the main point I think, writing should be a joy. So I recommend this to everyone experiencing difficulty in writing: give a chance to stories, I am pretty positive that you are going to enjoy it. Thank you again for this beautiful post, Henneke. Hi Anil, I’m happy to read you got yourself unstuck by starting to write what you wanted to write. Perhaps you can enjoy your blog writing more if you start incorporating stories? Dear Henneke, till few months ago, I thought storytelling was a way someone uses to tell lies for selling stuff or cheating people. You have demonstrated that storytelling is a way to tell the truth in a fascinating and enticing way. So I decided to write stories, because I discovered that I had ever told stories without knowing I was (as everybody) a natural storyteller. Your book about the criminal case will no doubt be full of intriguing stories, too. Happy storytelling, and thank you for stopping by! Henneke, not only do I love your blog, I enjoy the meaningful conversation among your followers. Wonderful post, Henneke! I was just scouring the internet for a post on storytelling 🙂 It seems like a lot of people are held back because they don’t think they have stories to share, so those examples are great- not every story has to be a deeply personal story! Thank you for stopping by, Camilla! Everybody has a story that they can tell and share. Just depends on mustering up the ability to tell it. What I started to do is write down many events that took place in my life and analyzing them to see how and where I can incorporate them into a story. That certainly helps me. P.S. If you ever decided to be a fiction or non-fiction author, I would so read that book. Your way with words is captivating in blog posts, I can only imagine how it’ll be in book. That sounds like an interesting way to see how you can incorporate more stories into your writing. I tend to do it the other way around, first consider the topic of the post, then think about a story that fits. I might try your process instead! This article have helped greatly now I can continue my stories in my blog thanks. I’m glad you found this article useful, Ojo. Happy story writing, and thank you for stopping by.